Today you will venture from your home to the airport where your flight will whisk you away to the storied streets of Thailand, ready and waiting for your discovery. The lavish temples and remarkable legends, lush trees and delightful food, have filled your mind and beckoned you closer. You can almost taste the fresh noodles and mint. You can almost see the locals’ friendly smiles. The plane brings you ever closer to the unique streets of Bangkok; soon nothing will stand between you and your discovery of Thailand. Set down in the fantastic metropolis of Bangkok, Thailand. The city overtakes the horizon and continues in every direction. At first the streets can be overwhelming; however, the city easily welcomes and settles you in nicely. You will be met at the airport by a private transfer and you will journey through the inexhaustible energy of the city beside the banks of the Chao Praya River. The afternoon is yours to relax and explore the bustling neighborhoods at your leisure. You can always find a quiet elegance in the Supatra River House, where you can sit on the deck and admire the spectacular view of the waterway and the city beyond. The spring rolls are crunchy and light, while the red curry has a fabulous zip that brings the welcomed, subtle tingle of chili. After a luscious breakfast of fresh juice, fruits, and so much more you will step out into the city to discover its stunning history set beside the riverbanks and beyond. Chao Praya River is known as the “River of Kings,” and was once the most bustling highway in the city. Now the water is calm and quiet as you come to the Temple of Dawn. Before visiting the Royal Palace you can see the immaculate construction and glittering exterior of the Temple of Dawn in the early morning and at dusk. The central spire ascends over 210 feet high, decorated with colored glass and porcelain to help catch the light at various angles. You can even climb the stairs to get an expansive view of the river and the surrounding cityscape. Your tour continues with a visit to the most iconic of Thailand’s over 40,000 temples, many of them located within Bangkok. 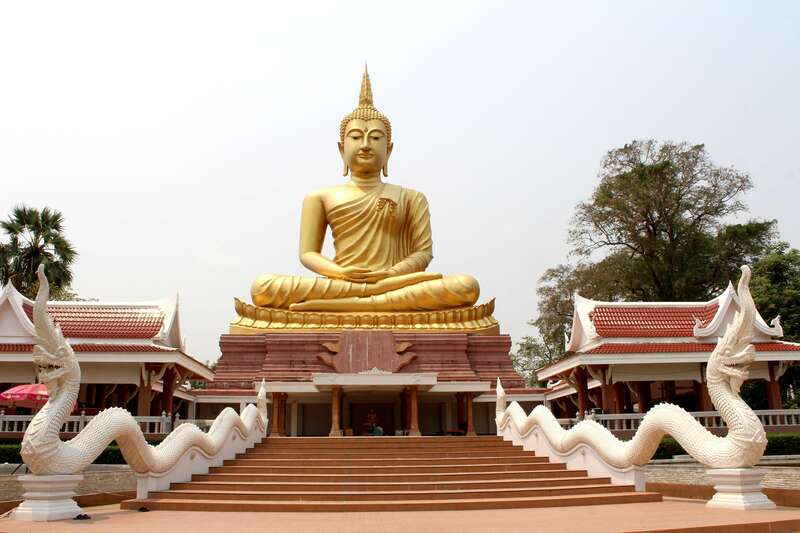 The Temple of the Golden Buddha features a statue weighing over five tons, made of pure gold and which was once covered in stucco to protect it from the invading armies. The exterior of the temple is lavish white with gilded trim, with the roofs shaped into concentric triangles. The interior is focused on the pristine sheen of the Buddha, rested in the moment of enlightenment. Whether along the riverbanks or traversing the old Chinatown and the temple of Wat Po, there is endless wonder to be found along the streets of Bangkok. The day is yours to do with as you please whether strolling through the Sukhumvit Road, a center for shopping and eateries, or wandering through the variety of temples and markets that you may have missed. If you want to experience a wonderful tradition overlooked by many visitors to the city, you can venture to the Floating Market at Lat Mayom. The area is visited by locals and Thai visitors from around the country to appreciate the local food and easy prices. The boats are stocked with vivacious goods from jackfruit to seafood, and hover around the riverbanks stretching bags that dangle from poles, perfecting the reach from boat to land with the goods exchanged and money paid. Whether you prefer to stay on a boat and linger amongst the vendors or sit on the banks with the sizzling grills filling the air with both sound and aroma, the market is an experience that should not be missed. Lush pink lilies sprout in garden ponds. Some locals even open up their kitchens, cooking up succulent noodles. After breakfast you will be met at your hotel by a private transfer who will guide you to the airport in time for your flight to Chiang Mai, the capital city of northern Thailand. The jungle clad north is also home to rustic tribal villages and the remarkable Old City within modern Chiang Mai that dates back 700 years. Even within the encompassing size of the city there remains an atmosphere more akin to a modern town, where the smiles are present, the streets are serene, and you can settle into the luxuries that include elephant rides and bamboo rafts, secluded cafes, and immaculate temples. You can see the spire of Doi Suthep rising over the trees on the mountaintop, shimmering in the afternoon sun. The majesty of elephants dates back through Thailand’s illustrious history; their grandeur stemmed from their power and grace. After breakfast you will venture outside of Chiang Mai’s city limits and into the dense trees and meandering mountains, arriving at one of the many elephant camps that espouse the region and the once revered animal. At the camp you can see the traditional techniques used to train elephants throughout Thai history, garnishing a lavish past and present that gives sanctuary to the gracious and friendly mammals. You have the option to climb aboard the favored elephant and journey through the forest as it marches between the trees and over the undulating grounds. Later in the day you will venture through the varied temples of Chiang Mai to discover the local splendor set within the towers and tremendous displays of dedication and spirituality. Near the 4,800 foot peak of Doi Suthep you will find the beginnings of a staircase beneath the overhanging trees. The stairs are laid with colorful brick set between roaring dragons which have guarded the temple from spirits for centuries. Ascend the 306 steps and you will find yourself on the platform that overlooks the valley below. The rising chedi adorns that mountaintop like an extra peak while you stand beside the sparkling white elephant, said to have chosen this spot for the temple to reside. Delight in your superb breakfast beside the stunning tree line before you are met by your private transfer and whisked to the airport. Soon you will lounge along the pristine beaches of Phuket, located off the western shores of Thailand. The central mountain is where the island derives its name. Filled with lavish greenery and crystal water, you can spend days there relaxing or exploring, either option giving you the same sense of respite and fulfillment that you seek. The soft and sweet scent of the sea eases the warm day. You can hear the jovial cries along the shore and you are ready to sink into the sand and feel the cool reach of the water. Today you will step out into the sun and off of the immaculate sandy shores of Phuket cruising out along Phang Nga Bay. The water mists into the air in a cool spritz on your cheeks. The wind blows through your hair as you venture along the water’s glassy surface. The famous limestone karsts stand erect and ominous in the water, jutting out like magnificent stalagmites located around James Bond Island, named for its appearance in “The Man with the Golden Gun.” At Khai Island you can witness the unparalleled reef that encircles the sand. Copious fish that glow shades of yellow and orange can be seen whether you view them from above or below the water’s surface. The salty air is touched with a random sweetness that brings blush to your cheeks. The sun sparkles along the effervescent waterline as you make your way back to Phuket’s shores. Wake up to the alluring scent of the sea and the freshly pressed coffee that calls you to breakfast. The day is at your leisure meant to give you the best of the island at your own pace, from the sea to the mountains, the trees to the reef. Whether you prefer to spend your time lounging in Karon beneath an umbrella with a cold drink by your side or adventure to the mountain summit to see the over 130 foot tall Big Buddha you can relax or explore, luxuriate or discover. For a trendy and overlooked spot that offers you an overview of Phuket Town, you can head to Khao Rang. Many people come to visit the Big Buddha; however, a grand and lavish time can be spent beneath the comfortable shade on the patio of Tung Ka Café. You can sip a drink or delight in a traditional lunch while watching the mixture of city and jungle extend to the sea. You can stretch your legs a little at Wat Kao Rang Nok, strolling through the three wooden praying rooms and various Buddha statues. You can hear birds chirping, monks praying, and the overall beauty of the island comes to a delicate stop. Today you wave goodbye to the sweetness of Phuket Island as a private transfer takes you to the airport to return to Bangkok. Your return to the city will have you in close comforts to the airport giving you the day to explore or relax at your leisure. The city remains open and vibrant, continuing its energetic glow. For a relaxing and easy day you could visit the Golden Mountain, a lush, tree filled mountain that overlooks the city offering an escape from the bustling streets, and one more chance to stroll along the lush, tranquil greenery. Quiet music plays as frangipanis and thick vines line the walkway. Birds chirp, the gentle trickle of the waterfall lingers in the air, and you will have discovered another secret in a city of hidden whispers. There is a sweetness to breakfast that drifts through the air; decadent banana and fresh squeezed orange juice lightens the already buoyant morning. A private transfer will take you from your hotel to the airport where your flight will soon have you soaring over the Pacific en route home. You have seen majestic islands and marvelous jungles, wandered through exquisite temples and floated in crystal clear water. Your time on this tour has taken you deeper into the whispers of Thailand’s grandeur, letting you discover the country’s wonder. Soon you will settle at home with every intention of returning to discover even more of Thailand. Enjoy a private guided tour through the remarkable history of Bangkok and its illustrious temples. Spend a day getting to know Bangkok at your leisure, with its diverse markets and sensational combination of tradition and modernity. Experience Chiang Mai’s jungle grandeur, situated along the boarder of the city. Witness the splendor of elephants with a visit to one of the many elephant camps outside of Chiang Mai. Discover the immaculate beauty of Phuket Island, from its beaches to its varied jungle. Cruise through the pristine water of Phang Nga Bay and snorkel around the pure reef of Khai Island.